What happened on the streets of in Cairo on May 25 resonated around the world, particularly with those of us in Pakistan, who saw a sort of milder preview of the Cairo action eleven days earlier on the streets of Lahore. Then, plainclothes policemen and policewomen had attacked peaceful, unarmed demonstrators and targeted the women for sexual abuse and humiliation by tearing their clothes. 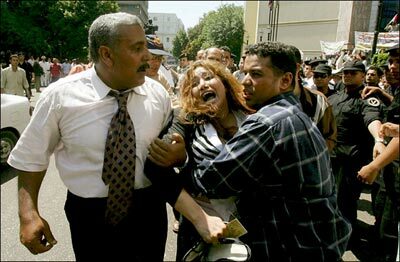 In Egypt, they went a step further and besides beating them, stripped some women naked, sexually abused and groped them. What’s going on here? At the risk of sounding facetious, it’s all about public space, stupid. reaction to it — public space is shrinking for women. At any rate, it is under attack. We’ll come to that in a minute. about the great respect they have for women, and how heaven lies beneath a mother’s feet, and how, on the Day of Judgement, you shall be identified not by your father’s but by your mother’s name… But when it comes to ground realities, it is a different matter. tradition – is fair game. But it’s not even as simple as that. Women in our societies have already transgressed a fair number of barriers. Increasing numbers are in previously male-only or male-dominated professions and spheres of society – airline pilots (and now even air force, in Pakistan at least), engineers, doctors, lawyers, scientists, dentists, politicians (even a prime minister in Pakistan). But it is when they engage in any public activity that has connotations for the power brokers, that the might of the state is unleashed upon them. Policemen and women, who are representatives of the state, are now encouraged and empowered to resort to violence that can take on sexual connotations, including sexually harassing, abusing, and tearing off the demonstrators’ clothes in order to humiliate them in public. We’ve been seeing this phenomenon since the days of Gen Ziaul Haq, starting with the horrific incident of 1984 when three females were stripped naked and marched through the streets of Nawabpur, near Multan, for a transgression supposedly committed by their brother-in-law. The man himself died later, having been beaten beyond recognition. Perhaps such incidents took place before but were simply not reported. But at least the state wasn’t involved in this public humilation, although political prisoners, including women, have long been subjected to such abuse in the ‘Land of the Pure’. On May 14 in Lahore, representatives of the state in Pakistan attempted such public humiliation for the first time when a policewoman ripped the clothes of well known lawyer Asma Jahangir and some of the other women participating in the token mini marathon on a main road of Lahore. Their transgression: simply trying to make a point – by running together with men on the side-street of a main road, to assert the right of women to non-segregated public space. particular event? Because the slogan of public space and equality for women was like a red rag to the orthodox forces which include, sadly, the police, the very institution that is supposed to protect the citizenry from unlawful acts. some were groped and manhandled. The testimonies that have since been circulated make for horrific reading. The Egyptian journalists’ union has also demanded the dismissal of Interior Minister Habib al-Adli. And another informal grouping of women has launched a “White Ribbon national apology campaign,” initiated by Ghada Shahbandar, a teacher and member of Kifaya, together with a female television presenter and a housewife. This campaign, popularised by emails and cell phone text messaging has received tremendous feedback and support, said Shahbander talking to AFP, in a report posted by Al Jazeera in its English language website on May 31. And that, it seems, is what it’s all about.